5 Modern Day Explorers You Should Look Up To. And Why. But exploration is not over — humans will always find ways to go beyond what went before. In fact, I’d argue that this is the essential impulse of life: to strive for a state of deeper being and deeper understanding. The difference that the 21st century has brought, it seems, is that explorers must now do more than merely visit some unseen place; they must find the meaning therein, and share that meaning with the world. These five contemporary explorers have heeded the call to the wild. They have proven their knack for adventure. But more importantly, they are bringing to light some of the most important issues we face as a global society. Eruç aboard his 23 foot ocean rowboat, Calderdale, in the Indian Ocean. At 41 years old, after an education in engineering and a long career in consulting, Erden Eruç left his so-called “real job” to pursue his passion for human-powered outdoor adventures. For his warm-up” journey, Eruç loaded a touring bicycle and trailer up with the necessary high-altitude mountaineering gear and set out from his home in Seattle in February 2003. He rode up to the edge of Denali National Park, snowshoed in to the Kahiltna Glacier base camp, and climbed to the summit of Denali on 29 May 2003. Then he loaded up his kit and rode home. Thus began his Six Summits Project, with the goal to climb the highest peaks on every continent except Antarctica after reaching them by human power alone. The effort was inspired by the death of Eruç’s climbing partner, Göran Kropp. Beginning in 1995, Kropp rode a bicycle from his native Sweden to Nepal and climbed Mount Everest. Several years later, Kropp was tragically killed in a climbing accident in Washington — in 2002, Eruç was belaying him when he fell 60 feet after a piece of protection didn’t hold and a carabiner broke. Inspired by Kropp and driven by his own unfathomable motivations, on July 10, 2007 Erden Eruç set out to become the first person to circumnavigate the globe by human power alone. The first 312 days were dedicated to rowing across the Pacific Ocean, from California to Australia. Eventually successful, his incredible solo journey covered 41,196 miles by rowboat, sea kayak, touring bicycle, and foot. He started a non-profit organization, Around-n-Over, with the aim of educating children around the world through his travels and raising money for various charities. Along the way Eruç took side trips to climb Mount Kosziusko in Australia and Mount Kilimanjaro in Africa, and has so far completed half of his Six Summits Project. With the summits Elbrus, Aconcagua, and Everest remaining, Erden Eruç has much more adventuring ahead of him. Follow Erden Eruç on Instagram. I met Kt Miller on a skinning trip in Cooke City, Montana last winter. After a week with a crowd of grungy mountain men I was instantly taken by her effervescent personality and thoughtful optimism. Little did I know, Miller is an incredibly talented skier and photographer on the verge of redefining much of the ski industry. Miller has found her way into photographing some of skiing’s most innovative expeditions in the past few years — Alaska and Romania and her native Beartooth Mountains outside of her hometown of Bozeman, Montana. She claims that before she was six months old she was skiing around Bridger Bowl in her dad’s backpack; now, at 24, Miller is a leading light in the big mountain ski world. After a stint in photography school Miller made her way back to the mountains and found a way to unite her passion for skiing with camera in hand. It didn’t take long for me to realize why she has been called on by some of the industry’s biggest players — Backcountry Magazine, Patagonia, Zeal: I just needed to try to keep up with her leading the crew up the skin track. Her hard work and talent have landed her sponsorships from Dynafit and Lowepro. Miller is more than a solid photographer who can rip, though. Along with her positive attitude, she brings a thoughtfulness and respect for the mountains into every project; rather than “bigger, higher, harder,” she considers the meaning behind her objectives. 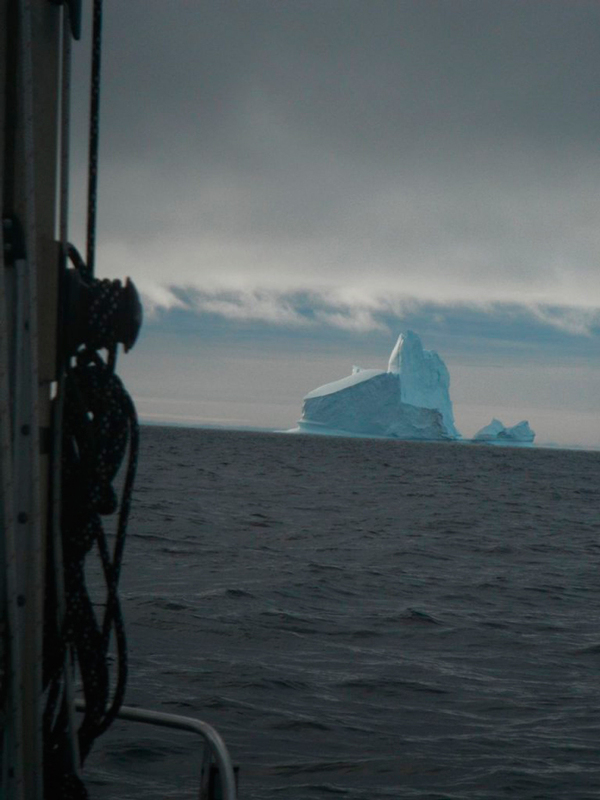 In Spring 2014, Miller was a member of the all-female Shifting Ice, Changing Tides expedition. The five set sail from Iceland, bound for Greenland. The purpose of the journey was to document and raise awareness of climate change and to ski first descents on the island of Greenland, all while inspiring other women to adventure and explore. Kt Miller has a long career ahead of her — keep an eye on this one. Follow Kt Miller on Instagram. Matt Rutherford had a rough childhood. Growing up in Annapolis, he struggled with learning disabilities and acted out. At 17, he found himself sitting in a jail cell contemplating his life trajectory. Some switch flipped and he decided to commit blindly: Rutherford bought a sailboat off the internet and taught himself how to sail. Four years later he embarked on a successful double trans-Atlantic single-handed sail on his 32-foot Pearson sloop. That is, he sailed from Maryland to Europe and back, alone. For most sailors this would be accomplishment enough (single-handing a small sailboat across an ocean is not for the faint of heart). But Rutherford, as an explorer does, wanted to push his boundaries. The Northwest Passage was first successfully sailed in 1906 by the Norwegian explorer Roald Amundsen (the same one who was the first human to the South Pole, and the first to undisputedly reach the North Pole). This treacherous route through the Arctic has only recently become possible to unfortified vessels; in 2007 the European Space Agency announced that pack ice in the Arctic had receded enough for a navigable route water route to open for boat other than Arctic ice-breakers. Above: A film documenting Rutherford’s experience circumnavigating the Americas is available for purchase on Vimeo. Since his accomplishment, Matt Rutherford has set to pursuing scientific research by sail. He founded the Ocean Research Project and led the Trans-Pacific Plastic Pollution Survey, a 7,000 mile sail from Sausalito, CA to Yokohama, Japan collecting information and samples for analysis by various scientific groups. He continues his work to understand the Earth’s oceans and to educate people on how to preserve this resource. While an undergraduate at Boston College, Balog discovered a deep love for the outdoors and witnessed the birth of a lifelong passion for mountaineering. After cutting his teeth in the White Mountains of New Hampshire, he began traveling much further afield to climb — Europe, Alaska, and Asia. Toting a camera along on his climbs, Balog realized that his passion for photography and adventure could be combined with the deep understanding of geomorphology he gained as a Masters student at the CU Boulder. And so he began a career as a professional photographer devoted to challenging humanity to consider their relationship with nature and how it could be improved. Hanging Elk in a Bucket, from Balog’s first book of photography, Wildlife Requiem, published in 1984. Over the course of his thirty-year career, James Balog’s photography has been seen by millions, printed in books, magazines, and online, and made into films. More recently, Balog started the Extreme Ice Survey, a project with the aim of documenting the effects of climate change in an immediately graspable way. Above: The trailer to Balog’s 2012 master stroke, Chasing Ice. To do this, Balog and his team fixed high-resolution cameras to shoot time-lapse imagery of glaciers. His incredibly stirring results were presented in the 2012 documentary, Chasing Ice. This month Balog’s newest film project, 1000 Cuts, will debut at Mountainfilm in Telluride. The film documents the effects of oil drilling in one of America’s most beautiful and tenuous landscapes, the Greater Canyonlands of Utah. Follow James Balog on Instagram. 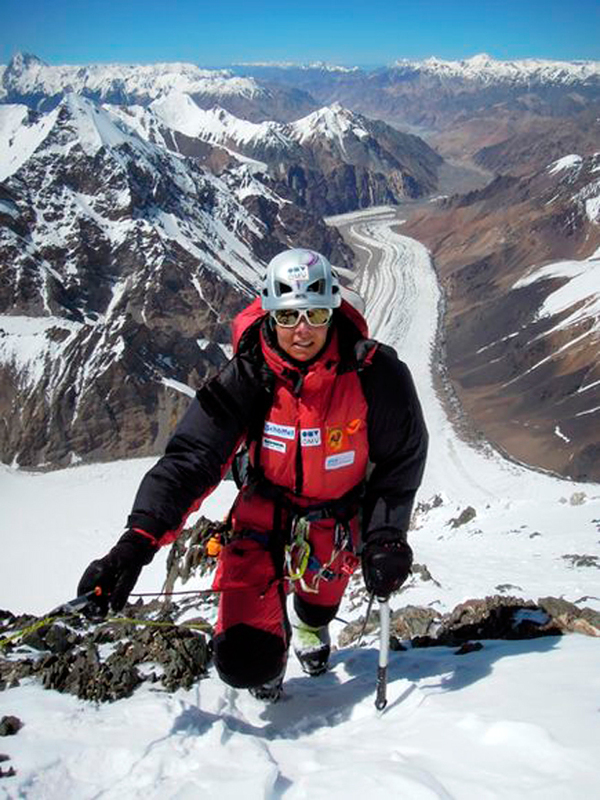 Gerlinde Kaltenbrunner attempted K2 seven times before she reached its summit. She could have hired a high-altitude porter or brought an oxygen bottle to ease the journey — she opted against it. Kaltenbrunner is an idealist, and remained committed to her values through the duration of an ultimately successful 13-year journey to climb all the 8,000 meter peaks in the world. 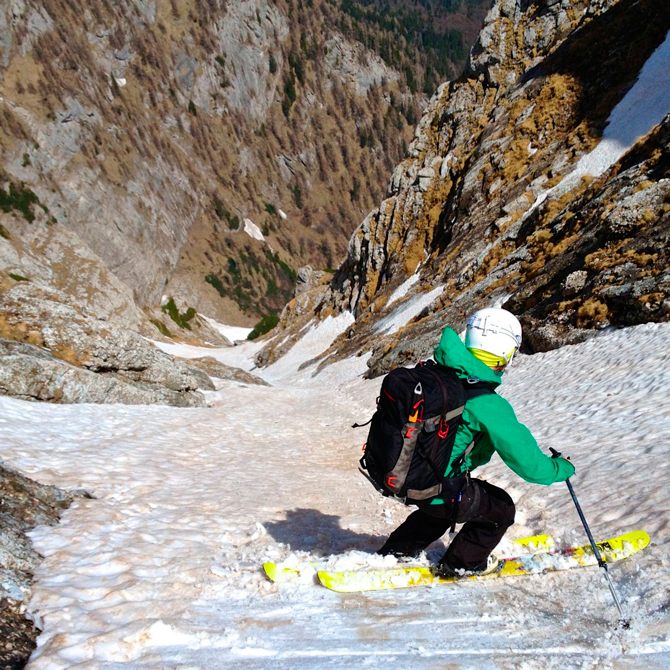 Kaltenbrunner’s upbringing in a village in northern Austria injected a deep love for the mountains in her constitution. At 27, Kaltenbrunner summitted Cho Oyu on the Tibet-Nepal border and began the long relationship with the high Himalaya that culminated on the summit of K2 in August 2011. Just a year earlier Edurne Pasaban, a Spanish mountaineer, had become the first woman to successfully climb all the 8,000 meter peaks. However, Pasaban had used oxygen on Everest in 2001 and employs the use of high altitude porters. The two women often climbed together and both humbly denied the presence of a negative competitiveness between them — both were committed to the same goal, but didn’t see it as a race. Rather, it was a challenge, and they could help each other achieve that challenge. Kaltenbrunner and her husband, Ralf Dujmovits (another alpinist), are involved in a Nepalese charitable organization, Beilngries. The non-profit has built schools, health projects, and an orphanage in the Nepali Himalaya. Kaltenbrunner’s discipline, conviction, and strong ethical grounding have earned her a place amongst mountaineering’s venerable elite. These people have made it their lives’ work to inspire others. We each ought to strive to find our own greatest contribution to the world, as they have found theirs.